The Samaritan Pentateuch, also known as the Samaritan Torah (Hebrew: תורה שומרונית torah shomronit), is a text of the first five books of the Hebrew Bible, written in the Samaritan alphabet and used as a scripture by the Samaritans. It constitutes their entire biblical canon. It first became known to the Western world in 1631, proving the first example of the Samaritan alphabet and sparking an intense theological debate regarding its relative age versus the Masoretic text. Some Pentateuchal manuscripts discovered among the Dead Sea Scrolls have been identified as bearing a "pre-Samaritan" text type. Wide agreement now exists among textual critics that the Samaritan Pentateuch represents an authentic ancient textual tradition despite the presence of some unique variants introduced by the Samaritans. Modern scholarship connects the formation of the Samaritan community with events which followed the Babylonian Captivity. One view being that the Samaritans are the people of the Kingdom of Israel who separated from the Judaites (people of Judah). Another view is that the event happened somewhere around 432 BCE, when Manasseh, the son-in-law of Sanballat, went off to found a community in Samaria, as related in Neh. 13:28 and Josephus Antiquities XI.7.2; 8.2. Josephus himself, however, dates this event and the building of the temple at Shechem to the time of Alexander the Great. Others believe that the real schism between the peoples did not take place until Hasmonean times when the Gerizim temple was destroyed in 128 BCE by John Hyrcanus. 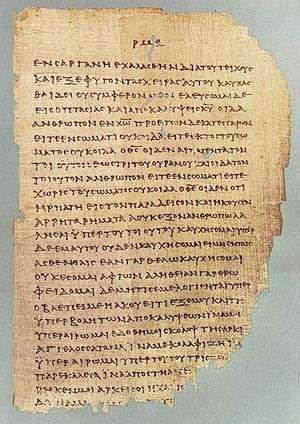 The script of the Samaritan Pentateuch, its close connections at many points with the Septuagint, and its even closer agreements with the present Hebrew text, all suggest a date about 122 BCE. The publication of a manuscript of the Samaritan Pentateuch in 17th-century Europe reawakened interest in the text and fueled a controversy between Protestants and Roman Catholics over which Old Testament textual traditions are authoritative. Roman Catholics showed a particular interest in the study of the Samaritan Pentateuch on account of the antiquity of the text and its frequent agreements with the Septuagint and the Latin Vulgate, two Bible translations to which Catholics have traditionally ascribed considerable authority. Some Catholics including Jean Morin, a Jesuit-convert from Calvinism to Catholicism, argued that the Samaritan Pentateuch's correspondences with the Latin Vulgate and Septuagint indicated that it represents a more authentic Hebrew text than the Masoretic. Several Protestants replied with a defense of the Masoretic text's authority and argued that the Samaritan text is a late and unreliable derivation from the Masoretic. Scholia of Origen's Hexapla and the writings of some church fathers contain references to "the Samariticon" (Greek: το Σαμαρειτικον)., a work that is no longer extant. Despite earlier suggestions that it was merely a series of Greek scholia translated from the Samaritan Pentateuch, scholars now concur that it was a complete Greek translation of the Samaritan Pentateuch either directly translated from it or via the Samaritan Targum. It may have been composed for the use of a Greek-speaking Samaritan community residing in Egypt. In April 2013, a complete English translation of the Samaritan Pentateuch comparing it to the Masoretic version was published. One of the co-authors, Benyamim Tsedaka, is himself a member of the Samaritan community and lectures widely on Samaritan history, beliefs and traditions. 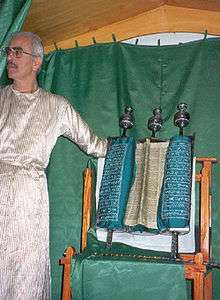 Samaritans attach special importance to the Abisha Scroll used in the Samaritan synagogue of Nablus. It consists of a continuous length of parchment sewn together from the skins of rams that, according to a Samaritan tradition, were ritually sacrificed. The text is written in gold letters. Rollers tipped with ornamental knobs are attached to both ends of the parchment and the whole is kept in a cylindrical silver case when not in use. Samaritans claim it was penned by Abishua, great-grandson of Aaron (1 Chronicles 6:50), thirteen years after the entry into the land of Israel under the leadership of Joshua, son of Nun, although contemporary scholars describe it as a composite of several fragmentary scrolls each penned between the 12th and 14th centuries CE. Other manuscripts of the Samaritan Pentateuch consist of vellum or cotton paper written upon with black ink. Numerous manuscripts of the text exist, but none written in the original Hebrew or in translation predates the Middle Ages. Several publications containing the text of the Samaritan Targum have appeared. In 1875 the German scholar Adolf Brüll published his Das samaritanische Targum zum Pentateuch (The Samaritan Targum to the Pentateuch). More recently a two volume set edited by Abraham Tal appeared featuring the first critical edition based upon all extant manuscripts containing the Targumic text. 1 2 Flôrenṭîn 2005, p. 1: "When the Samaritan version of the Pentateuch was revealed to the Western world early in the 17th century... [footnote: 'In 1632 the Frenchman Jean Morin published the Samaritan Pentateuch in the Parisian Biblia Polyglotta based on a manuscript that the traveler Pietro Della Valle had bought from Damascus sixteen years previously.]" 1 2 The Canon Debate, McDonald & Sanders editors, 2002, chapter 6: Questions of Canon through the Dead Sea Scrolls by James C. VanderKam, page 94, citing private communication with Emanuel Tov on biblical manuscripts: Qumran scribe type c.25%, proto-Masoretic Text c. 40%, pre-Samaritan texts c.5%, texts close to the Hebrew model for the Septuagint c.5% and nonaligned c.25%. 1 2 Gaster, T.H. "Samaritans," pp. 190–197 in Interpreter's Dictionary of the Bible, Volume 4. George Arthur Buttrick, gen. ed. Nashville: Abingdon, 1962. ↑ Vanderkam 2002, p. 91. ↑ Gaster, M. (1908). "A Samaritan Book of Joshua". The Living Age. 258: 166. 1 2 Tov 2001, pp. 82–83. ↑ Tov 2001, p. 83. 1 2 Buttrick 1952, p. 35. ↑ Brotzman 1994, pp. 64–65. ↑ Tov 2001, p. 81. "Only in recent generations have the Samaritans written a few manuscripts – only for use outside their community – with full vocalization." 1 2 3 4 5 6 Fallows, Samuel; Andrew Constantinides Zenos; Herbert Lockwood Willett (1911). The Popular and Critical Bible Encyclopædia and Scriptural Dictionary, Volume 3. Howard-Severance. p. 1701. 1 2 Hjelm 2000, p. 77. ↑ Thomson 1919, pp. 286–289. ↑ Thomson 1919, pp. 289–296. ↑ Thomson 1919, pp. 296–301. 1 2 3 4 5 6 7 8 Vanderkam 2002, p. 93. ↑ "Overview of the Differences Between the Jewish and Samaritan Versions of the Pentateuch". Web.meson.org. Retrieved 2011-12-05. 1 2 Soggin, J. Alberto (1989). Introduction to the Old Testament: From Its Origins to the Closing of the Alexandrian Canon. Westminster John Knox Press. p. 26. ISBN 9780664221560. "But there is at least one case, Deut.27.4–7, in which the reading 'Gerizim' in the Samaritan Pentateuch, confirmed by Σ and by the Old Latin, seems to be preferable to that of the Massoretic text, which has Ebal, the other mountain standing above Nablus." ↑ "Exodus – Interlinear Pentateuch". Google. Retrieved 2014-01-05. ↑ Thomson 1919, p. 312. ↑ Vanderkam 2002, p. 94. ↑ Easton, Matthew George (1897). "Samaritan Pentateuch". Easton's Bible Dictionary (New and revised ed.). T. Nelson and Sons. ↑ Barton 1903, p. 31. ↑ Thomson 1919, pp. 312–313. ↑ Du Pin, Louis Ellies (1699). A compleat history of the canon and writers of the books of the Old and New Testament, Volume 1. H. Rhodes. p. 167. ↑ Pamphili, Eusebius (translator: Robert Bedrosian). "Eusebius' Chronicle: The Hebrew Chronicle". History Workshop. Retrieved 10 July 2012. ↑ Montgomery 1907, p. 286. ↑ Montgomery 1907, p. 288. ↑ Thomson 1919, pp. 275–276. ↑ Saebo, Magne (2008). Hebrew Bible / Old Testament: The History of Its Interpretation. Vandenhoeck & Ruprecht. ISBN 9783525539828. ↑ Kennicott 1759, p. 32. ↑ Kennicott 1759, p. 20. ↑ Gesenius, Wilhelm (1815). De Pentateuchi Samaritani origine, indole et auctoritate commentatio philologico-critica. Halae. ↑ Vanderkam 2002, pp. 92–93. ↑ Kahle, Paul. Theologische Studien und Kritiken 88 (1915): 399–429. ↑ Some examples include the Dead Sea Scroll manuscripts conventionally designated as 4QpaleoExodm, 4QExod-Levf and 4QNumb. See Vanderkam 2002, p. 95. ↑ Tov 2001, p. 80. ↑ Vanderkam 2002, p. 95. ↑ Vanderkam 2002, p. 106. ↑ Vanderkam 2002, p. 110. ↑ Skehan, Patrick, Eugene Ulrich and Judith Sanderson (1992). Discoveries in the Judean Desert, Volume IX. Quoted in Hendel, Ronald S. "Assessing the Text-Critical Theories of the Hebrew Bible After Qumran," p. 284 in Lim, Timothy and John Collins (2010). The Oxford Handbook of the Dead Sea Scrolls. Oxford: Oxford University Press. ISBN 9780199207237. ↑ Frank Moore Cross Harvard Theological Review July 1966 "The language of the Samaritan Pentateuch also includes archaizing forms and pseudo-archaic forms which surely point to the post-Maccabaean age for its date"
↑ Crown 2001, p. 401. ↑ Charlesworth, James H. "The Discovery of an Unknown Dead Sea Scroll: The Original Text of Deuteronomy 27?". Ohio Wesleyan Magazine. Retrieved 29 July 2012. 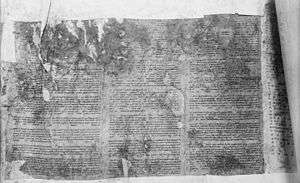 A newly published Dead Sea Scroll fragment of Deuteronomy has "Gerizim" instead of "Ebal" in Deuteronomy 27:4. 1 2 3 4 Herbermann, Charles, ed. (1913). "Samaritan Language and Literature". Catholic Encyclopedia. New York: Robert Appleton. ↑ Crown 2001, p. 18. ↑ Buttrick 1952, p. 57. 1 2 3 Brotzman 1994, p. 66. ↑ Marcos, Natalio (2000). The Septuagint in Context: Introduction to the Greek Version of the Bible. Brill. p. 168. ISBN 9789004115743. ↑ Crown 2001, p. 23. ↑ Crown 2001, p. 24. ↑ Crown 2001, pp. 24–25. ↑ Tsedaka, Benyamim; Sharon Sullivan (2012). The Israelite Samaritan Version of the Torah: First English Translation Compared with the Masoretic Version. Grand Rapids, Michigan, USA: Wm. B. Eerdmans Publishing Company. ISBN 9780802865199. ↑ Montgomery 1907, pp. 293–297. ↑ Montgomery 1907, pp. 297–298. ↑ Barton 1903, p. 9. ↑ Barton 1903, pp. 9–10. ↑ Eshel 2003, p. 215. ↑ Cowper, B. Harris (1863). Journal of Sacred Literature and Biblical Record. Williams and Norgate. p. 131. ↑ Phillips, D.L. Hebrew-English: Paleo Exodus: Scripture at the End of the Iron II Period. Edwin Mellen, 2004. ↑ Tal, Abraham F. (1981). The Samaritan Targum of the Pentateuch: a critical edition (2 vols. )(Texts and Studies in the Hebrew Language and Related Subjects, 5.). Tel-Aviv: Tel-Aviv University. Eshel, Esther and Hanan Eshel (2003). "Dating the Samaritan Pentateuch's Compilation in Light of the Qumran Biblical Scrolls." In Tov, Emmanuel; Eva Ben-David and Weston W. Fields. Emanuel: Studies in Hebrew Bible, Septuagint, and Dead Sea Scrolls in Honor of Emanuel Tov. Brill. ISBN 9789004126794. Shoulson, Mark E, compiler. The Torah: Jewish and Samaritan versions compared (Hebrew Edition, December 2008). Evertype. ISBN 1-904808-18-2 / ISBN 978-1-904808-18-3. Samaritan Pentateuch – online edition with select verses from the Samaritan Targum, English translation and critical apparatus.